Playing a crucial role in winning two Premier League titles in three years usually places a squad member in high regard. Diego Costa is the exception to the rule. He left Chelsea prematurely in 2017, three years into his five-year deal when Chelsea boss Antonio Conte texted the Spanish international that his services were no longer required. The decision had nothing to do with the 30-year-old's performance on the pitch. Costa scored 52 goals in 89 appearances for the North London side. Ironically, considering the manager's own flair for the theatrical, it was the Brazilian-born striker's antics that led to his exile. He arrived at Chelsea with a reputation for tussling with opponents. In his first stint with Atletico Madrid, Costa battled several defenders, notably Real Madrid's centre-back duo, Sergio Ramos and Pepe. The cold and rainy English weather didn't douse his combative spirit. If anything, it ignited it. He received a three-game ban for violent conduct after stamping on Liverpool midfielder Emre Can in January 2015. Later that year, he was at it again when facing Arsenal. When Costa lashed out at Arsenal's Laurent Koscielny, Mike Dean flashed a red card at Gabriel Paulista for what he interpreted as a vengeful act. The FA later overturned Paulista's red card, temporarily delaying Dean's inevitable march towards a sending-off century. Instead, they levied a three-match ban on Costa. In March 2016, another eruption occurred. Costa reportedly spat in referee Michael Oliver's direction before attacking Gareth Barry. It looked to many as if the short-tempered striker had bitten the Toffees midfielder although Barry later denied it. Even so, Costa's initial two-match ban was extended to three upon disciplinary review and he was also fined £20,000. Costa wasn't any gentler to teammates or coaches. A training ground row in 2017, culminated in Costa suggesting he could make more money in China and Conte shouting at him to go. The pair tacitly agreed to detente in order to complete Chelsea's drive to the Premier League title. When the season ended, however, the Italian gaffer pulled out his cell phone and gave his thumbs a workout. While the price for parting with the prolific striker was a lost season and his job, Conte at least had the satisfaction of watching his antagonistic finisher wait out Atleti's six-month transfer ban so that he could return to Madrid. Diego Simeone welcomed Costa to the club's new Metropolitano digs with open arms. But even the most foul-tempered leopard doesn't change his spots, let alone pick them all that well. The prolific forward's outbursts continued. From crunch tackles to berating match officials, he did it all. Unfortunately, while the antisocial aspects of his game remained in peak form, his scoring touch waned. Two goals in 16 outings during Los Colchoneros' effort to keep pace with Barcelona in La Liga's title chase didn't meet expectations. Then, against Barcelona themselves with an opportunity to close the gap to five points, Costa let the team down spectacularly. 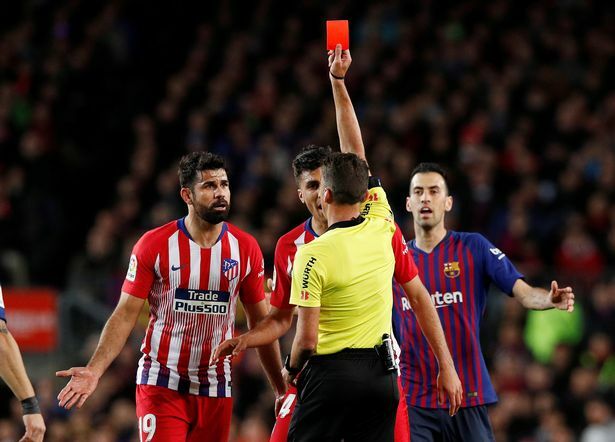 When a routine tackle was not penalised, he scrambled to his feet, charged towards referee Jesus Gil Manzano, hurtling epithets that, according to the match official, maligned his innocent mother. He was begging for a red card and that's exactly what he received, effectively extinguishing Atletico's title hopes. In his post-match interviews, Diego Simeone conceded that insulting the official's mother was worthy of sending off. Across town at the Santiago Bernabeu, Zinedine Zidane shook his head in sympathy for both player and coach. Atleti President Enrique Cerezo was not pleased. AS reports Sporting Director Andrea Berta is shopping his temperamental striker with the Chinese Super League the most likely and profitable destination. Only the A-League would be further away. If Diego Simeone calms his employers and Costa remains, will he finally learn? Don't bank on it. Sooner or later, a ticking time bomb always detonates. What do Real Madrid have in Eder Militao?